Do you still code? If so which language? First of all: Thank you for all you've given and all you've done to make the world a better place. Given the recent targeting of health professionals in Pakistan and Nigeria, do you think eradication of polio is attainable in the next decade? How is the Gates Foundation going to get over this barrier to eradication? Also, what is your opinion on the anti-vaccination movement in general? First of all, thanks Mr. Gates for doing this. I’ve been a fan of you since I was a little kid, taking solace in your success as a professional nerd and philanthropist. If Microsoft didn’t take off, what would you have done and be doing instead? You are a leader in the ultra-wealthy philanthropists, but what do you think that people of median income can do to help improve the world the most? If the microprocessor had NOT come along I am not sure what I would have done. Maybe medicine or theoretical math but it is hard to say. Most giving is done by the middle class so it is the backbone of generosity particularly in the United States. A key thing is to support government aid which is only 1% of the budget but helps poor countries in incredible ways. How do you measure the success of the foundation? How does the foundation differ from other large philanthropic organizations? Thanks for all that you and Melinda have done and continue to do! Hi Mr. Gates, The anti-vaccine movement does not only exist in developing countries, such as Pakistan, but is quite popular here in the United States as well. As a result, the number of flu and whooping cough cases are bigger than ever. Are you planning on working domestically as well? edit for related question: Which countries do you think serve as models for their initiatives towards an overall healthier society? ie. who's doing the best? I'm from India. What do you think are some of the biggest challenges India currently faces that's hindering its progress? At what point did you decide that it was time to retire and put the Microsoft part of your life behind you and focus completely on philanthropy? What do you do for fun? I find it hard to fathom how someone like you can just disconnect. Disconnect from the emails, calls, the media. All of it. What would be your definition of a chill and fun day? What's your worst fear for the future of the world? Hopefully we won't have terrorists using nuclear weapons or biological weapons. We should make sure that stays hard. I am disappointed more isn't being done to reduce carbon emissions. Governments need to spend more on basic energy R&D to make sure we get cheap non-CO2 emitting sources as soon as possible. Overall I am pretty optimistic. 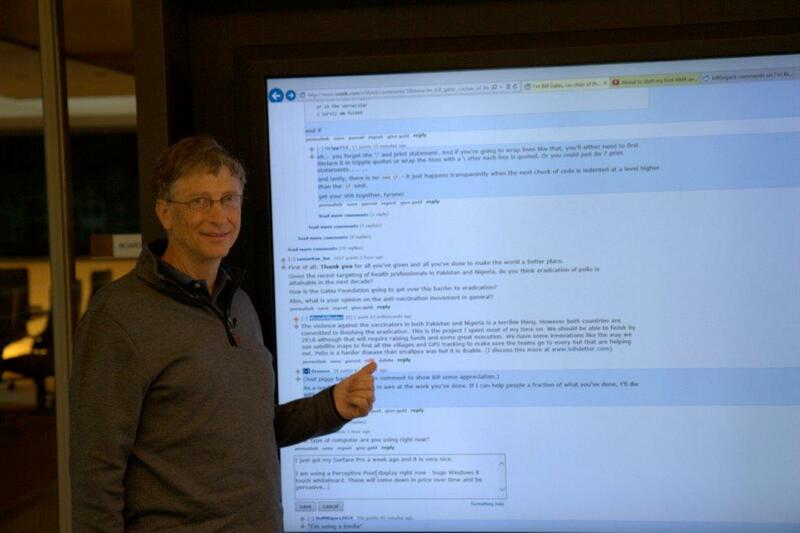 Things are a lot better than they were 200 years ago..
Hi Bill, I am just wondering what your thoughts are on Windows 8. Do you think in general it has failed? I am not saying it has, but there are people saying it is not good, and I wanted to hear your thoughts on it. It is a huge advance for Windows which people will see even more as the great applications and hardware come out..
Windows 7 or Windows 8? Be honest Bill. Mr. Gates I was happy to see you last year at the Math Strategy Group at Sunnylands. My question is how do you see technology enhancing Mathematics education without actually replacing it?